In a Cryptologia publication from 1992, Douglas W. Mitchell proposed an interesting cipher that does not require computer support: encryption with a Rubik’s Cube. I described Mitchell’s cube encryption method on my blog last year in October. This method represents a transposition cipher. The colors on the cube faces are irrelevant. 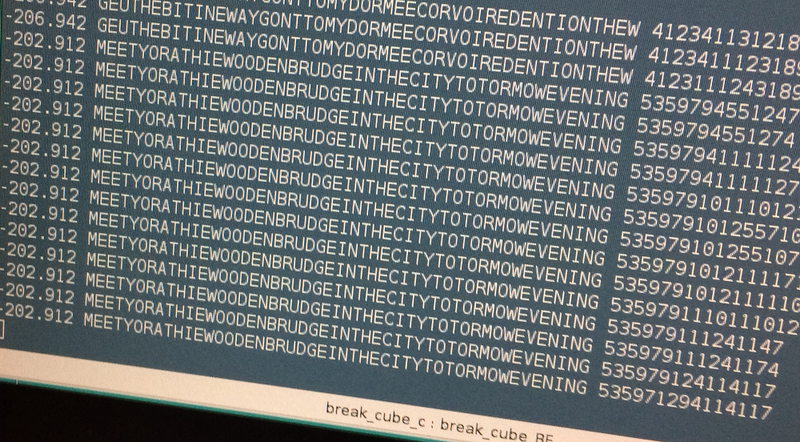 In fact, MEET YOU AT THE WOODEN BRIDGE IN THE CITY TOMORROW EVENING is the correct solution. Congratulations! It’s by far not the first time that Christoph has broken a notable cryptogram. Especially, in 2016 he solved a ciphertext created by Alfred Janes in the 19th century. 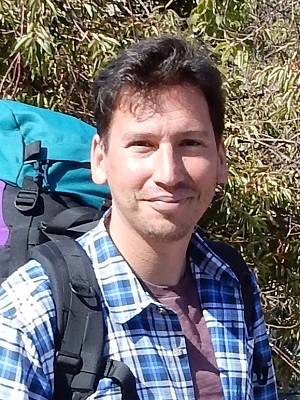 He received the Golden Alice 2016 in the “best codebreaking” section for this success. Christoph tried several solution approaches and wrote about 10 computer programs. Most of these used Hill Climbing, but none was successful. 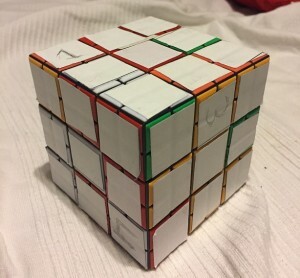 I liked the idea presented by Norbert in comment #5, so I started with the approach of a hill climber that assembles the cube from scratch using the given corner-, edge- and centerpieces in different combinations. Unfortunately this didn’t work out and I still don’t know why exactly. Maybe the plaintext is too short for that with only 48 characters. Then I thought that maybe Klaus was easy on us and used only a few moves to scramble the message. In addition, even if you use many moves to scramble the cube, there is probably a quicker path to solve it again. So I started to use an existing implementation of the moves from a library in python to shift the letters. Basically a brute-force approach. But that was way too slow to test beyond 6-7 moves deep. So I wrote my own implementation of the moves and ported everything to C++. In the end, I checked every combination of moves up to a depth of 12 for their final state. As a “check” of the state, I read off the letters and did a quadgram scoring. A big help when breaking this code with brute-force are the numbers from 1-6. There must be exactly one on each side for a solution to be valid. So I could skip the quadgram scoring almost all of the time. With some additional ideas, I didn’t have to check every possible move as some just undo the previous moves or combinations like MC90,MC90,MC90 can be reduced to just MC270 in Klaus’ notation. Still, the program took about two weeks on my desktop PC to find a readable (but not yet fully unscrambled) solution from which one could conclude on the plaintext. I think that Brute Force renders quite acceptable solution times. I was able to test about 4,500,000 “keys”, i.e. 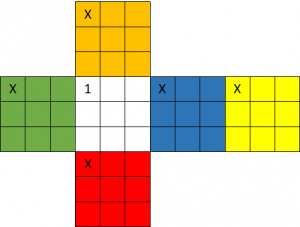 move combinations, per second, and evaluate those where the 6 numbers landed on different sides using quadgram scoring. Since there are always many ways to get a certain twist, evaluation of many ways can be skipped. My impression is: even if you use a key consisting of 20 moves, there is probably a much shorter way to the solution the Brute Force program will find in an acceptable time. In the screenshot you can see a state where the text was recognizable for the first time. The number on the left is the quadgram score, followed by the plaintext candidate and the move combination. Each number in it (5, 3, 5, …) stands for a certain twist like MC90, MC180, etc. 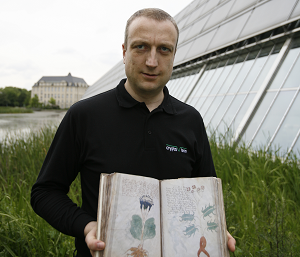 It goes without saying that I am absolutely impressed by Christoph’s codebreaking work. As it seems, he has was the first to deliver a proof that Mitchell’s cipher algorithm from 1992 is not secure. This is absolutely amazing. Congratultions and thanks for this outstanding contribution to my blog! Congratulations on your outstanding achievement! I also had tried to make a hill climber reassemble the cube from scratch (the approach that I had proposed), but like you, I had no success with it. After considering the effort of a brute force search over all possible n-move-sequences against the estimated chances of success, I did not implement it… Congratulations to you! 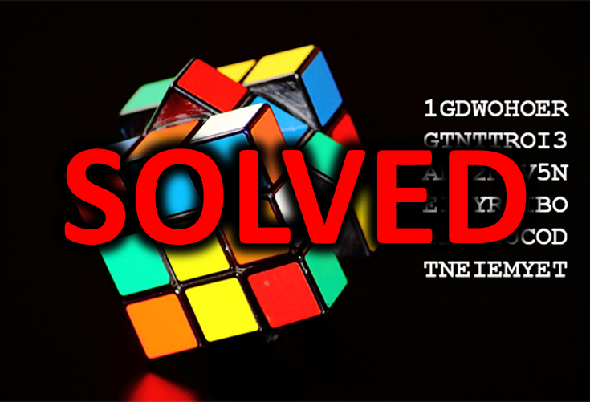 Interestingly, from the partial solution visible in the screenshot to the complete solution there are still 18 moves necessary (according to an online solver), even though only 4 pieces need to change position. Notation is according to the ruwix website. This is most likely not the key that Klaus used to encrypt, as it seems that he wanted to keep the piece with the 1 on it fixed in its position and thus applied only a subset of the usual moves. Attention: the cube holding position for decryption in this case is with the face GTNTTROI3 to the front and the face with WEHM4UCOD on it on the top. Which (or how many) moves did you use to scramble the cube for the challenge, Klaus?